Widespread data sharing by research communities adds significant value to research and accelerates the pace of discovery. The National Institute of Mental Health (NIMH) has established an informatics infrastructure to enable the sharing and use of data collected from human subjects in clinical research by the entire research community. Researchers funded by NIMH are strongly encouraged to deposit data from human subjects into this infrastructure. In addition, non-NIMH funded researchers with related data are welcome to deposit their data. At present, the NIMH Data Archive is a single Oracle database that has three different web sites that serve as front ends for different research communities. The three web sites are: the National Database for Autism Research (http://ndar.nih.gov, NDAR), the National Database for Clinical Trials Related to Mental Illness (http://ndct.nimh.nih.gov/, NDCT), and the Research Domain Criteria Database (http://rdocdb.nimh.nih.gov/, RDoC db). The data sharing expectations for data related to autism (NOT-MH-09-005) and data related to clinical trials (NOT-MH-14-015) have already been published. This Notice does not alter those data sharing expectations, but simply serves to further inform the research community of the data resources supported by NIMH. The National Database for Autism Research (http://ndar.nih.gov, NDAR) is an informatics platform that both stores clinical data related autism and allows queries to be launched both across the data held by NDAR as well as data held in other locations. The purpose of the platform is to support and accelerate the advancement of research into autism. As of March, 2015 data from more than 80,000 research participants is currently available. NDAR is supported by funds from NIMH, NINDS, NIEHS, and NICHD. The National Database for Clinical Trials Related to Mental Illness (http://ndct.nimh.nih.gov/, NDCT) contains legacy data from clinical trials such as Clinical Antipsychotic Trials of Intervention Effectiveness (CATIE) and Sequenced Treatment Alternatives to Relieve Depression (STAR*D). Data from new NIMH sponsored clinical trials (NOT-MH-14-007) will also be made available at this web site as will relevant trials funded by other sponsors. The Research Domain Criteria (RDoC) project is aimed at developing, for research purposes, new ways of classifying mental disorders based on behavioral dimensions and neurobiological measures. The Research Domain Criteria Database (http://rdocdb.nimh.nih.gov/, RDoC db) will aggregate clinical research data from all mental disorders. Does the data come from a clinical research study? Is there genomic data? If so, genomic data will likely be deposited to one of the dbGaP repositories while most phenotypic data will be deposited in the NIMH Data Archive. Genomic data related to autism will be deposited in NDAR and transferred to the appropriate dbGaP repository. Are biosamples being collected and shared with the NIMH Repository and Genomics Resource (NRGR)? 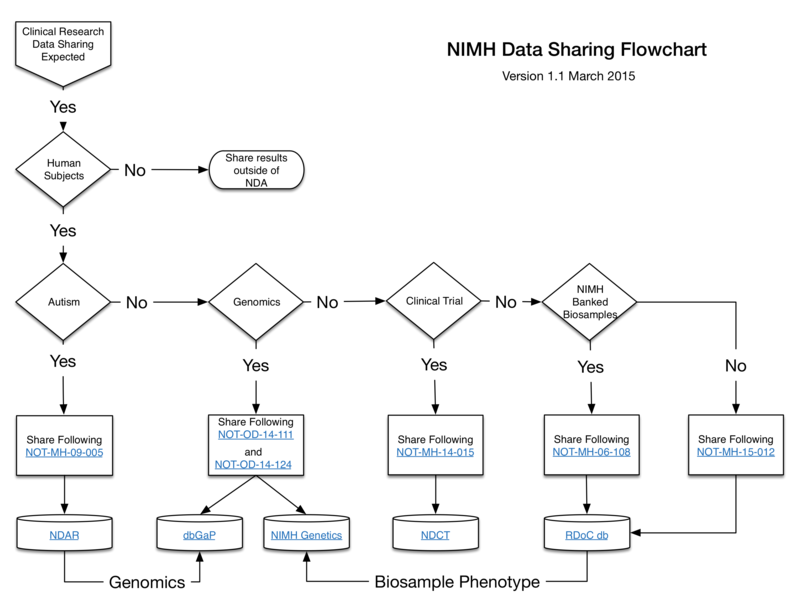 If yes, consistent with NIMH biosample sharing policies (NOT-MH-08-007, NOT-MH-13-002), biosamples and basic phenotype data will be submitted to NRGR while more detailed clinical assessments will go to the NIMH Data Archive. Is the data relevant to Autism Spectrum Disorders? If yes, data will likely be deposited through NDAR. Is the data relevant to clinical trials? If yes, data will likely be deposited through NDCT. Is the data clinical research but not a clinical trial? If yes, the data will likely be deposited through RDoC db. As of May 1, 2015, NIMH expects investigators and their institutions to provide basic plans for following this Notice in the “Data Sharing Plan” located in the Resource Sharing Plan section of grant applications. Compliance with this data sharing plan will become a special term and condition in the Notice of Award. The Institutional Certification (for sharing human data) should also be provided prior to award along with any other Just-in-Time information. Researchers who are funded by NIMH are strongly encouraged to share their data via the NIMH Data Archive, and to use NIMH Data Archive to advance their projects. This encouragement is extended to all investigators who have data related to mental illness, regardless of the source of support for their research. In order to allow investigators to prepare and budget appropriately, NIMH expects that applications involving clinical research with human subjects submitted for funding after May 1, 2015 will plan to submit their data to the NIMH Data Archive. Current NIMH awardees are invited to talk to their Program Officer about the possibility of submitting an administrative supplement request to allow data being collected in current studies to be shared using this infrastructure.